In the Exodus, Israel journeys from slavery in Egypt into a new life in the Promised Land, traversing the wilderness. However, the point of their journey goes beyond the acquisition of real estate. It is time when the Lord forms them as a people and they are invited to enter into relationship with the Lord. Today, we hear of a climactic moment when the Lord gives the people guidance for this all-important relationship. 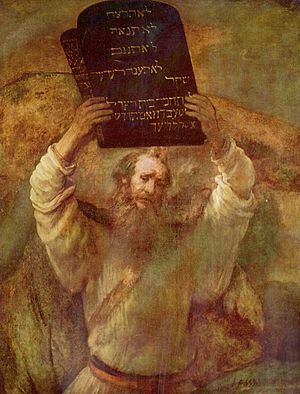 God speaks directly and authoritatively to the people in the terms we have come to identify as the 10 commandments. Notice that the better part of the message concerns the importance of total dedication to the Lord, including the deepest respect for the Lord’s name and the Lord’s day. Even in the commands that concern their relationships among themselves, it is the relationship with the Lord that remains central. To walk in righteousness with God is to be transformed in every way, including in all other relationships. This fairly simple list has stood the test of time and changed circumstances. It still provides powerful guidance, directing us towards the Lord in the moral and emotional wilderness of our own day. In the centuries after the Sinai trek, Israel would come to see in the Jerusalem Temple another mount where the people would come to encounter the Lord and find guidance and wisdom. The resulting great reverence for the Temple as a tool to know and worship God helps us understand the extraordinary nature of Jesus’ prophetic actions in the passage from John. In John’s Gospel, the “cleansing of the Temple” takes place at the outset of Jesus’ public ministry. It provides the immediate cause for the animosity of Jesus’ opponents. However, the real focus here is on Jesus’ authority – He is not rejecting the Temple, but asserting His authority over it as the Son of God. But the passage goes even further, we see Jesus speak of the “temple” of His body. What the Temple represented only as metaphor is now present directly to the people. As the Gospel of John makes clear, Jesus is the revelation of the Father. Right relationship with God and neighbor now flows from right relationship with Jesus. If the cleansing of the Temple shocked the witnesses, the real stumbling block came with the death of Jesus on the cross. The Gentiles knew that this form of Roman state terror was reserved for the lowest in society, the runaway slave, the murderer and bandit, and the failed rebel. No one favored by “the gods” could suffer such a fate. Pious Jews of the age could cite Deuteronomy 21:23, “cursed be he who hangs upon a tree” to object to a crucified Messiah. Their hopes for a deliverer concerned someone blessed by God. How could God permit such horror to His Servant? Early Christian preachers faced a real challenge in proclaiming a crucified Savior. If the New Testament is any indication, they themselves struggled to grasp God’s will in the aftermath of the death and resurrection of Jesus. They searched the Old Testament for signs of God’s hidden intentions and found insight in passages such as those of the Suffering Servant in Isaiah. Above all, they began to see the truth at the heart of Jesus’ passion – His absolute loving and trusting faithfulness for the Father. They began to perceive the good news that this apparent failure was in fact the moment when Jesus accomplished for us that which we could not accomplish by our own power – reconciliation to God. In addressing the Corinthians, Paul strives to shake them out of their conceit and force them to recognize both the gift that God offers and the demands that the gift place upon us. A gift is not a gift until it is received. Paul himself knew the power of that grace as he encountered Christ on the road to Damascus. Paul understood that it was not his own insight or goodness that changed him into a proclaimer of Christ. It was this new relationship - initiated by the Lord - that saved him from himself. In the strongest terms, he tries to draw the Corinthians into the same communion with the crucified Lord. The sacrifice of Christ makes demands upon us. It demands that we stop trying to set our own path and allow ourselves to be changed and directed to a new path. Our movement towards heaven is not a matter of spiritual real estate, but a journey towards proper relationship with God. God laid out that path with the law. Christ walks that same path before us and beside us. What remains now is our exercise of fidelity.